Watch out world, I’m not too happy at the moment. This, of course, is the result of the Phillies lackluster effort against the Giants yesterday. Once again, their bats failed to come to life, as they were shut out 3-0. One possible explanation: they were lulled to sleep by the most totally un-stirring, un-inspiring, un-energetic performance of the National Anthem that I have ever heard. I often wonder who chooses the anthem performers for the playoff games. You would think they might try to find someone with ties to the city where the game is being played. San Francisco has a rich musical history – Santana, Journey, Steve Miller, Train, I’d even take Huey Lewis. But we get someone named Ben Gibbard, of the band Death Cab for Cutie. They are from Seattle, and Gibbard is a self-proclaimed Mariners fan. They couldn’t at least find a Giants fan? My mood was not helped when rodeo clown wannabe, um, evil elf Cody Ross knocked in the first run of the game for the Giants. Replays showed the pitch was not down and on the inside half of the plate, like the three homers he’s hit so far off Phillies pitchers, but low and away. So how does he manage to pull that pitch and line it into left field? There’s only one logical answer: someone has been dealing with the devil. Games 1 and 2 of the NLCS are in the books, and the Phillies earned a split with the Giants. I’m not going to throw out a lot of stats, or bore you with yet another recap. That’s all available out there in plenty of places. Now, it’s time for my first batch of random thoughts. Giants catcher Buster Posey bears an uncanny resemblance to one of my neighbors. I’d post pictures here to prove it, but I don’t have a picture of said neighbor available. In fact, I just checked his Facebook profile, and he appears to have replaced it with a picture of Posey! Then again, it’s hard to tell the difference. Cody Ross, otherwise known as my least-favorite Marlin, has hit three (!) 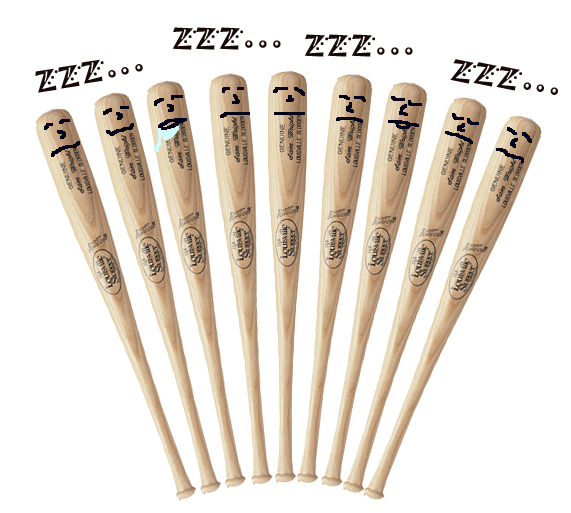 home runs so far in this series. Let’s see, Ross is with his fifth major-league team in seven seasons, and the Marlins apparently thought so highly of him that they released him in August, whence the Giants picked him up on a waiver claim. Somehow, he has turned into a post-season hitting machine, hitting .350 so far with 4 home runs and 6 RBI. Speaking of Ross (though I’d rather not), it looks like he has jumped on the “Fear the Beard” bandwagon, sprouting some facial hair that was not there when he was with the Marlins. In fact, his clean-shaven self always reminded me of an elf. 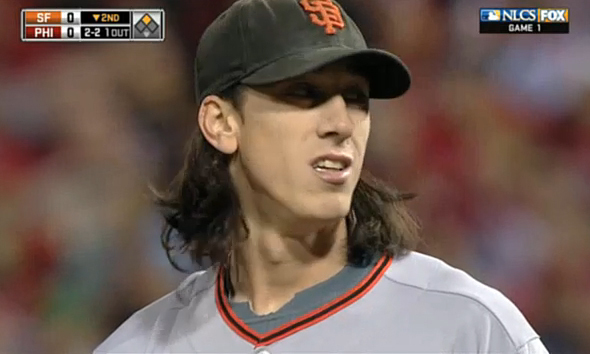 While we’re on the subject of beards, thanks to the wonderful technology of high-def close ups, I can confirm that it would be physically impossible for Tim Lincecum to grow one, since he appears to have approximately three facial hairs in total. Prior to last night, Jimmy Rollins had not had much success at the plate this postseason, with just one hit in the divisional series against the Reds. His first “hit” of the NLCS came when the Giants infield forgot how to call for a pop-up, and the ball dropped safely in the midst of Mike Fontenot, Jonathan Sanchez, Aubrey Huff, and Buster Posey. Ryan Howard caused quite a stir among the Phaithful when he was spotted at Sunday afternoon’s Eagles game. Shouldn’t he have been preparing for that night’s baseball game, perhaps watching film or taking some extra swings in the cage? It’s not like he was ripping the cover off the ball in Game 1, and he would be going up against a tough lefty in Sanchez, against whom he has not had much success in the past. Do I feel bad for him? No, not really. No game tonight, as it’s an off day as the series moves west to San Francisco for Game 3.